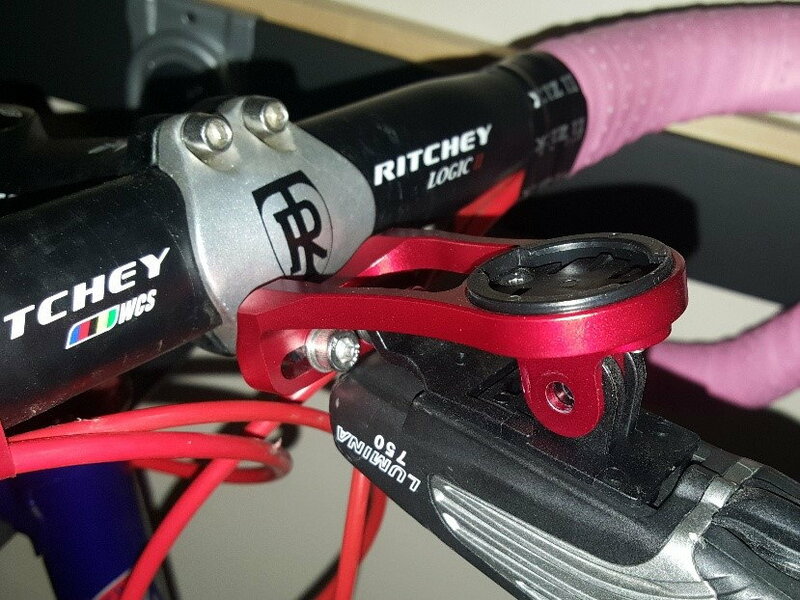 So, real estate was getting scarce on my handlebars I came up with the great idea of getting a light & Garmin mount that attaches to the stem. Problem solved; no, not quite. 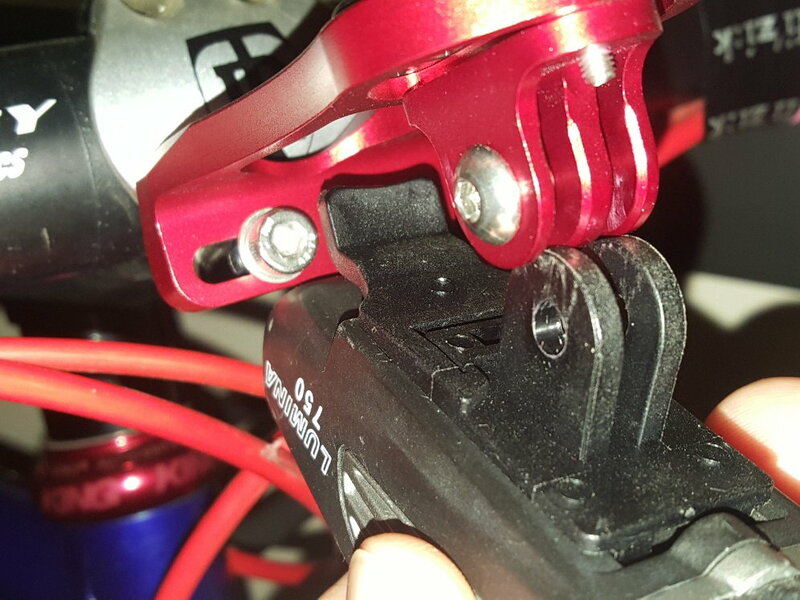 So, the Niterider light hits the bolts if you try to angle in any useful position. Because it cannot be angled, the light just shoots out to no where. So, trying to brain storm a solution. Flat top bolts may do it, but I think the light will still hit the bolts. What about making a small 1-2" extension? The question is: what material would be best for trying to make an extension. Piece of aluminum, cut slots in it? Or try to use a piece of hard rubber? Any ideas out there? Thanks. Looks like the back of the light is just not clearing the bolts. Maybe replace with button head bolts like the front one in the first picture. 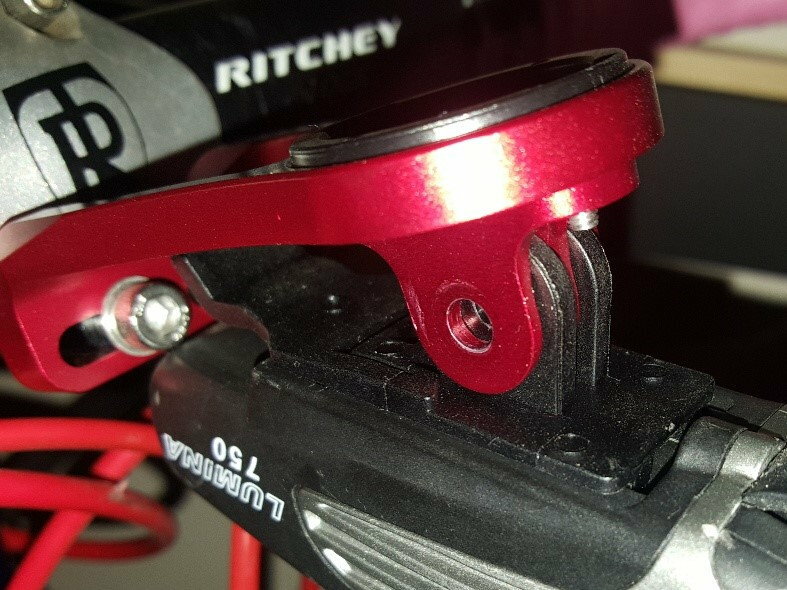 Another option could be removing some of the material from the part of the Garmin mount the bolts go through, to make it thinner. It looks like it's pretty thick and would take it. I don't know where you're planning the Garmin mount, but it looks like the light mount is upside down, and would clear fine if you reversed it. But, it may be that you hung it that way to allow for the Garmin mount, in which case just ignore me and go on about your problem-solving. +1 on both. Obviously start with button heads. Might only take a very slight filing of the back of he light to clear them as button heads are rounded. Any way to remove material from the mount to recess the heads of the bolt? I just dont know at what point the strength will be compromised; there is a lot of pressure in that area. That's a standard GoPro mounting interface. There are plenty of adapters available. This one looks perfect. You can even add a second light. wow, the extension is perfect. I didn't know how I missed this in my search. Changing Spring On Campagnolo Nuovo Record F Derailleur?